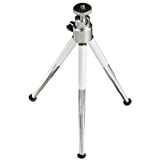 Small and lightweight, this tripod offers outstanding portability. You can conveniently take it with you anywhere on the go, whether it be to shopping tours, family celebrations or whilst walking across the countryside. This entry was posted in Discount Photography and tagged Ball, Hama, Mini, Tripod, White by Ball Photo. Bookmark the permalink.